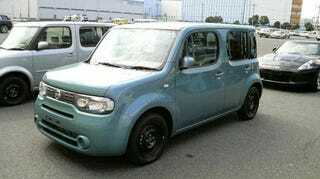 The 2010 Nissan Cube, bound for US sales and an LA Auto Show unveil tomorrow, has been revealed in these pictures of a car transit to somewhere in Japan posted on the Motive Mag forum. The new Cube retains its asymmetrical look while at the same time managing to look a bit sleeker than its predecessor. The grille shrinks a bit and the headlights get a more high tech look. The roof goes from pure flat to a slight curve and the rear of the vehicle retains the same backwards "S" sweeping across the glass from the rear door. We'll be looking for more details tomorrow at the official unveil, but enjoy these pics for now and wait in anticipation for the pending angry washing machine van wars to come.